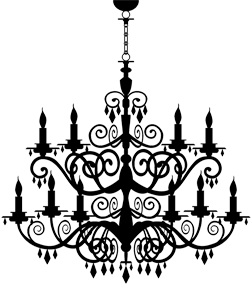 For those of you who have a masquerade party lined up, be it for Christmas or New Year, the Masked Ball is the most extravagent of events. Setting the scene of glorious ball rooms filled with fairy lights, dancing candle flames and shimmering gold & silver decorations, it is the perfect opportunity to take advantage of your surroundings by adorning yourself with an elegant gown and a beautiful masked ball mask, dressed with jewels, Swarovski crystals or glitter, that will sparkle throughout the night. If you are looking for a unique, luxury masquerade ball mask to go with your outfit, then here are some suggestions that we put together for you. Our beautiful, extravagent Limted Edition “Luxury Swan Mask”, adorned with Swarovski Element Clear Crystals, black beaded lace & an array of black feathers, is a perfect match for this divine Alice & Olivia Jessica Beaded Lace & Feather Peplum Gown. Complete the outfit with matching Swarovski Crystal element Cinderella Platform shoes. This elegant Q-pid Showgirl Chiffon Dress is teamed with Nina Nina Elizia embellished shoes and our Samara luxury jewelled venetian masquerade mask (which features mixed purple feathers, diamante decoration and genuine Swarovski Crystals on the side). This purple masquerade mask can also be customised with extra feathers, stick or made in a different colour. Peacock masks are very popular and as luck would have it, we offer a large range of peacock masquerade masks & peacock venetian masks. 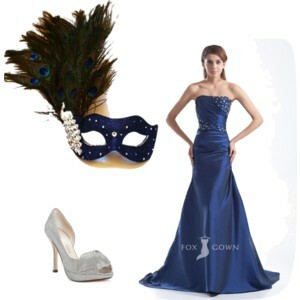 This collection shows one of our Luxury Peacock Feather Masquerade Masks, (which is embellised with Swarovski crystals & a silver diamante peacock) aside a gorgeous navy blue evening gown (by Fox Gown) & silver evening shoes. This particular mask is handmade to order & comes in many colour combinations. If you have a smaller budget, then we do offer other peacock masks.